Always rinse your hair in the shower before getting in the pool. If your hair is "filled up" with clean tap water it won't be able to absorb as much chlorinated pool water. There's usually a shower right near the pool that you can use to rinse your hair before and after diving in. Apply a thorough coating of a silicone serum to your dripping wet hair. The serum will help protect your hair from the force of the water. Choose an inexpensive serum like John Frieda Frizz-Ease Original Serum, $7.50. (Optional) Put on a swim cap. Many swim caps are so tight that they pull your hair out when you take them on and off. Try a Speedo Silicone Swim Cap, $7.99. If a swim cap causes you to lose hair, don't use it. Just let your strands hang free instead. After you swim, rinse your hair with tap water again. It's best to wear a hat if you plan to stay in the sun after you exit the pool. Always shampoo your hair after you're done swimming for the day. It's important to use a shampoo that gets rid of chlorine and mineral build up. If your regular shampoo contains EDTA or Phytic Acid it will provide thorough enough cleansing. If your regular shampoo doesn't contain EDTA or Phytic Acid, buy UltraSwim Chlorine Removal Shampoo, $15.21 for a pack of 4 ($4.99 each MSRP) for pool days. Continue with your usual shampoo and condition routine. You must take the time to condition your hair every time you shampoo it, even if you swim every day. When you style your hair it would be best to avoid direct or high heat. Try to limit your use of heat to a blow dryer with a diffuser attachment or a bonnet dryer on low. Are you a swimmer? What's your hair care regimen? 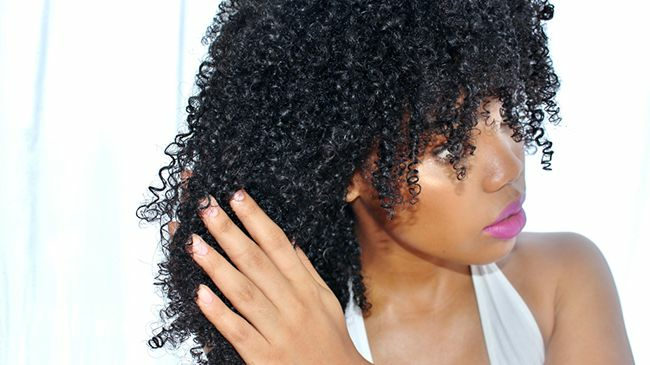 This was written by Nicole Hollis of Hair Liberty for CurlyNikki.